To set up the daily time limit for using a given application, open application tab in Control Center app on your phone. <You will see all the APPs >, which are installed on your child’s phone. Then find the app for which you want to set up a limit. 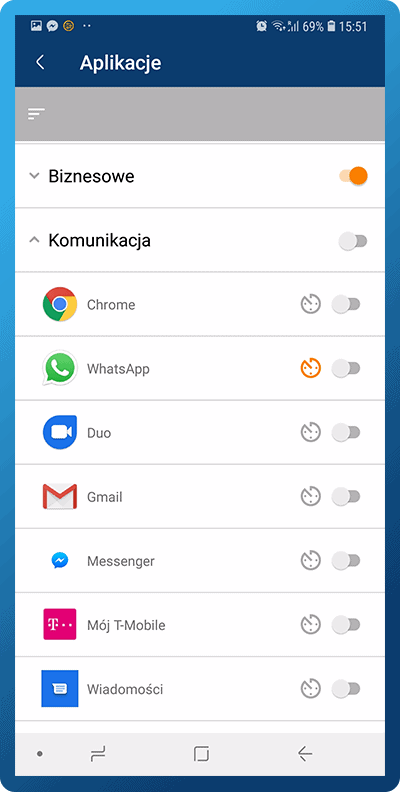 Click the clock icon displayed next to the application. 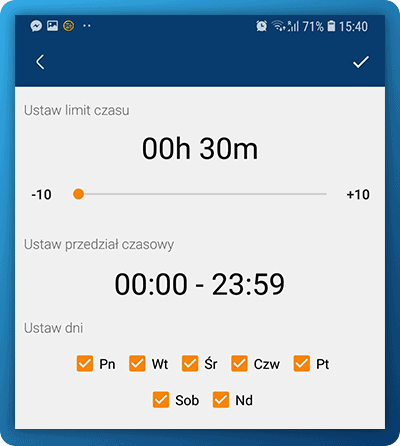 There you can set up a time limit for given application. Clicking the slider next to the application and moving it to the left will result in the application being completely blocked (the child will not be able to use it at all). You can also block whole category – for ex. communication. Then all applications in this category will be automatically blocked. You can also set a time limits or block the applications in <ACTIVITY> panel, which shows you all the apps used by your child.